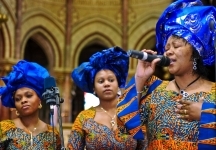 African Gospel Choirs and culturally diverse musical acts have become increasingly more popular at religious and civil wedding ceremonies & receptions over recent years. 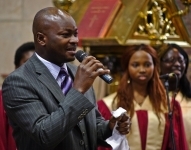 Our authentic, Ireland-based, African choirs have also been in great demand for movie sound tracks, radio & TV appearences in Ireland since 2006. Treat your guests to an unforgetable and spritual experience by booking one of our African Choirs for your ceremony or choose from a variety of bands, DJs and MCs to entertain at your wedding or drinks reception. With over 20 years Europe-wide experience in this sector we will be able to deliver a truly memorable occasion for your guests. Surprise your guests with something exotic at your reception. 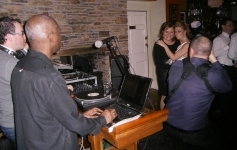 We are frequently asked to supply diverse and unique acts to add some spice and variety to a wedding reception, especially when the bride or groom has cultural connections and interests outside Ireland. Want to avoid that inevitable 'barber shop quartet, jazz combo or tribute band' conundrum? How about a Soukous band from The Congo? guaranteed to keep granny on the dancefloor waving her arms in the air until the wee small hours, let alone the young ones. From the traditional music of Zimbabwe to a Reggae DJ and MC, Rumba Based Guitarista Music, Afri-Jazz, Afropop, devotional music from India, Colombian Salsa, Soul/Funk/Blues combo, Punjabi bhangra DJ (and everywhere in between) .... we've done it all before. 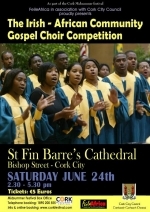 You can purchase a copy of the 2006/7 African Gospel Choir Competition CD recorded live at St Finbarre's Cathedral Cork City directly from us for 5 Euros + postage. The CD contains 11 entries from the choirs of Cork, Naas, Portlaoise, Cavan, Dublin & Limerick. Contact us and pay by Paypal.